Obama’s digital effort stands out first for its scale on various platforms compared with Romney’s. At the time of our analysis (June 4-17, 2012), the Obama campaign had public accounts on nine separate platforms: Facebook, Google+, Pinterest, Tumblr, YouTube, Flickr, Instagram, Spotify and two accounts on Twitter (@BarackObama and @Obama2012). That is twice that of the Romney campaign, which had public accounts on Facebook, Twitter, YouTube, Flickr and Google+. Romney has since expanded his presence, adding accounts on Tumblr and Spotify. The Obama campaign is also substantially more active in these domains. Across all the platforms studied, the Obama campaign posted nearly four times as much content as the Romney campaign-614 Obama posts compared with 168 posts for Romney. The gap in activity was greatest on Twitter. Romney averaged one tweet a day. Obama averaged 29 tweets a day, (17 per day on @BarackObama, the Twitter Account associated with his presidency, and 12 on @Obama2012). The Obama campaign also had about twice as many blog posts on its website than did Romney’s and more than twice as many YouTube videos. The two campaigns were closer in the level of activity on Facebook, where both candidates averaged about two posts a day (and Romney was slightly more active). Overall, the Romney campaign was most active on Facebook and blogs, while Obama was most active on his two twitter accounts, posting here even more frequently than on his website blog. Compared with 2008, the Obama campaign has made its digital messaging more targeted and it has reduced the role of the traditional press. The site also offers 18 different constituency groups that users can join-groups very similar to those the campaign offered in 2008. Another change is that the range of issues Obama is talking about has substantially narrowed. Four years ago Obama’s website featured different pages delineating the candidate’s position on 22 different issues. This election cycle, the campaign offers pages on eight-and foreign policy is not among them. The Romney campaign this year has pages delineating his positions on 24 separate issues-eight of them tied to foreign policy and seven of them tied to economic issues. But, here, too, there is evidence of a different emphasis from 2008. McCain offered 16 different issue pages but only seven overlap with those on the Romney site. 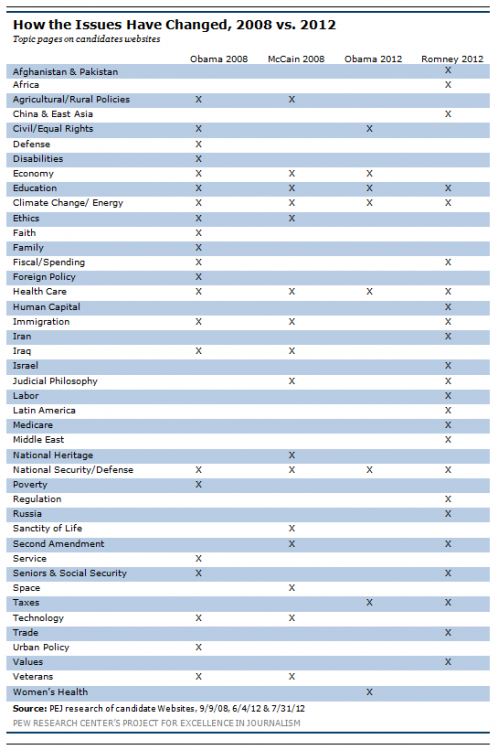 The change in the list of issues being debated in 2012 versus 2008 offers a hint of how much the campaigns believe that the concerns of the American voters have been altered by the end of the war in Iraq and the effects of the recession. In 2008, among other issues now off the digital agenda, McCain talked about Iraq, agricultural policy and space. Romney does not address these but talks about Iran, China, Israel, trade and fiscal spending-all new. Obama four years ago had pages focused on about three times as many issues as this year. But taxes and women’s health are there in 2012. They were not subjects that had dedicated pages in 2008. Also gone in 2012 from Obama’s website is a channel dedicated to featuring how he has been described by the news media, featuring clips and links to external news reports. Instead the information offered all comes from the campaign in the form of images or words produced internally or selected content from citizens. 1. For the time period studied (June 4, 2012 to June 17, 2012), this report considered those platforms that the candidates’ respective websites listed and linked to.